Ani Kasten was born on November 28th, 1976 on Nantucket Island, Massachusetts, U.S.A. Her father, Samuel Kasten, b. 1949 in Des Moines, Iowa, is a textile artist and has produced fine, hand-woven fabrics, rugs, and carpets for his company, Sam Kasten Handweaver, since 1984. Her mother, Jane Kasten, b. 1948 in Lake Mills, Iowa, is an avid gardener, homemaker, and a private chef. The Kasten family left Nantucket in 1984 and settled in Housatonic, Massachusetts, where Ani and her sister Emily spent their remaining childhood, attending a Waldorf Elementary school. Ani Kasten later graduated from Interlochen Arts Academy, in Interlochen Michigan, and then completed her Bachelor’s degree in English Literature at the University of Michigan. After college, in the spring of 2000, Kasten began an apprenticeship with British ceramist Rupert Spira, where she gained a solid foundation in the production of functional studio ceramics under Spira’s strict instruction. After a year in England, Kasten traveled to Kathmandu, Nepal in 2001, where she spent four years as head of a project for developing a stoneware ceramic production facility for artisan potters in the village of Thimi, Nepal. Her training in England and her experiences in Nepal were a formative influence on Kasten’s ceramic sculpture and vessels, which draw on minimalist British studio ceramics, as well as weathered, hand-made antiquities made by indigenous peoples throughout Asia. Kasten greatly benefitted from sharing techniques and materials with artisans from far-flung cultures, and this has given rise to a unique artistic vocabulary that informs her own ceramic work. After leaving Nepal in 2005, Kasten established her first studio in the United States, in Oakland, California, where the fresh natural beauty of the California coastline in conjunction with extreme urban decay began to influence her work. 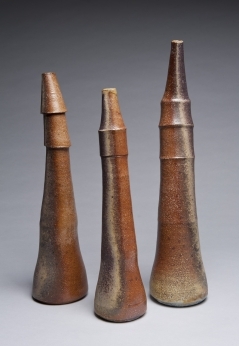 At this time, Kasten’s focus shifted from functional studio ceramics to sculptural ceramics. Kasten left Oakland in 2007 and became an Artist in Residence at Red Dirt Studio in Mt. Rainier, MD, where she worked closely with ceramic artist Margaret Boozer. Here, she further developed her distinct combination of sculpture and vessel work, showing her ceramics nationally at galleries and fine craft shows. In 2009, Kasten set up her own studio nearby Red Dirt Studio, in the Gateway Arts District of Prince Georges County, Maryland. In 2012, she purchased a historic storefront building in the center Mount Rainier, MD, where she was one of the pioneer artists, along with Margaret Boozer, J.J. McCracken and others, helping to shape the thriving arts community of the Gateway Arts District, located on the Prince Georges County, Maryland border of Washington, D.C.. Kasten spent a year renovating the old shoe repair shop to house her studio as well as workspace for other artists, and set up her home in the apartment over the studio. Kasten’s storefront studio and gallery, Artbar, was a draw for visitors and collectors, and became one of the neighborhood hotspots for people interested in local and nationally recognized art. In the summer of 2016, Kasten relocated once again, to the St. Croix River Valley, northeast of Minneapolis, Minnesota. The St. Croix River Valley is home to an established community of potters and ceramic artists, where Kasten will be a host studio for the historic St. Croix Valley Pottery Tour (which just celebrated its 25thAnniversary as one of the premier studio ceramics venues in the United States, exhibiting the work of over 70 nationally known ceramic artists). Kasten is renovating a small farm with a house and barn where her home, studio and showroom are located. She continues to exhibit her work nationally and internationally in galleries and fine craft exhibitions. She also creates custom work for designers and collectors on commission from her studio.